As Snapchat plugs away at proving that its vertical video ads work with data and machine-learning targeting, marketers are increasingly testing longer video and direct-response campaigns on the platform. 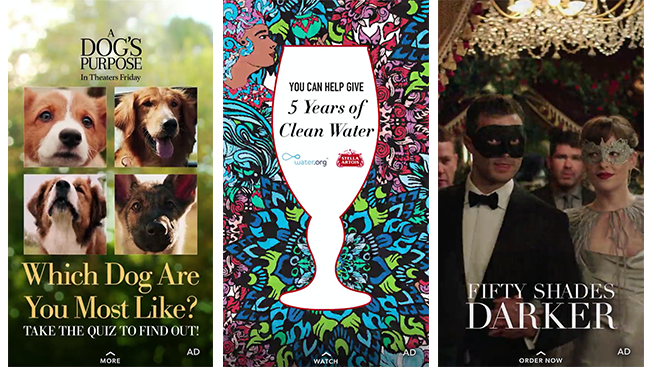 For the past three weeks, Adweek has tracked 53 campaigns within Discover, the section of the app where marketers run short video ads alongside content from publishers, and we found that 36 of them (or 68 percent) prompted users to take an action by swiping up on the screen. The other 32 percent were Snapchat's standard 10-second video ads. Fifteen (42 percent) of the campaigns Adweek observed that encouraged consumers to swipe up led users to longer videos when swiped. Another 14 campaigns directed users to websites, and eight campaigns pitched app-install ads. 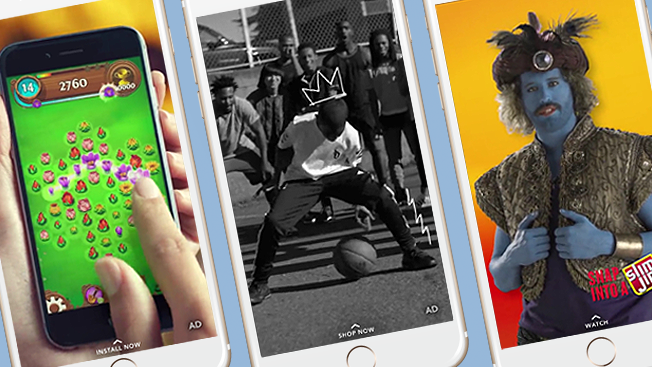 Moreover, a third of all of Snapchat's advertisers in Adweek's test were entertainment companies including Lionsgate and MTV. Food brands were another big category, with 13 advertisers including General Mills, Nabisco and Starbucks. It's worth noting that the test was only with one reporter's account, and a Snapchat rep said each user is served different ads based on targeting that gauges which ads people are most likely to swipe due to the content they look at. The rep stated each user also gets served a different number of ads based on how often they view Discover content. Snapchat has been pitching its twist on direct-response ads that link to app installs, longer videos and websites since last year as a way to compete for mobile advertising dollars with Facebook and others as it gears up for a rumored IPO this year. As part of its API program, Snapchat also has 15 partnerships with measurement companies—including Moat, Oracle Data Cloud and Nielsen—to help advertisers quantify their campaigns. Christina Miller, supervisor of social strategy at VML, said she has used Snap Ads with attachments to push consumers further down the purchase funnel. "We use the Snap Ads that link out if we have a deeper goal, further content, acquisition of some sort," she said. "The plain videos are more just for the goal of views [or] awareness—quick consumable content." And to avoid bombarding consumers with too many ads, "[Snapchat] was so careful in how they rolled out—they give a lot of guidance on that," she added. But Jill Sherman, DigitasLBi's svp of social strategy, warned that brands shouldn't go all in on swipe-up ads quite yet since users' own messages are capped at 10 seconds. "Snapchat is first and foremost still a messaging app, and Discover content created by publishers is still relatively short form," she said. "That said, I think brands should experiment with it, and learn where the drop-off is. There are best practices, but no hard and fast rules and some brands will likely find that the 10-second spot makes the most sense."